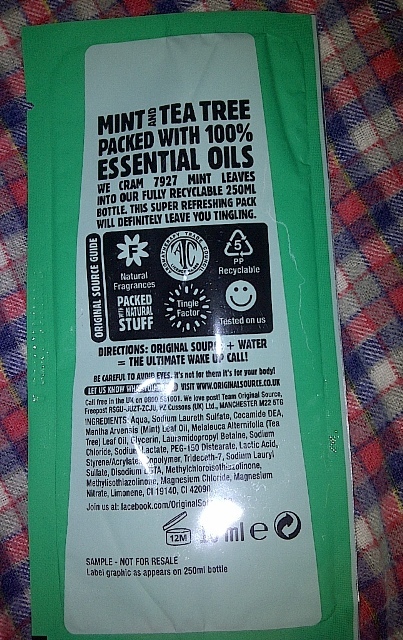 I also got the Original Mint and Tea Tree Gel sample from a swap with Raelessi and seeing the words, “tingling” and “mint” on the sachet made me try it at once. 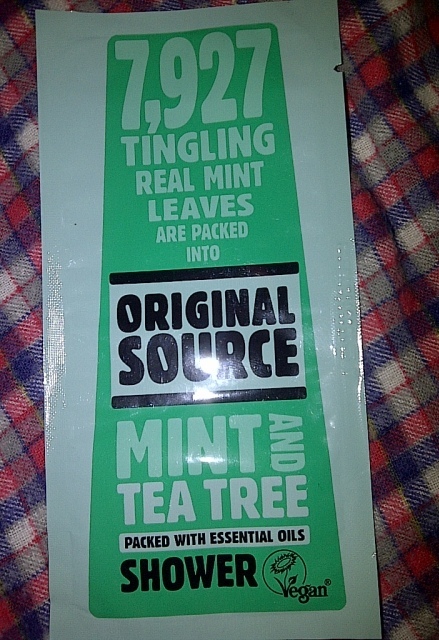 I’m not sure if Rae remembered that I like minty flavours but I was really glad that she sent me this. It’s hot and humid throughout the year here in Bangkok and it is usually hotter around the months of March to May so this little goodie came at the right time! First Impressions: This shower gel had me at “7,927 Tingling Real Mint Leaves…” on its label, including the Original Source Guide printed at the back of the sachet which says “Natural Fragrances, Packed with Natural Stuff, Tested on Us… And Tingling Factor”. Consistency: It’s not too thick but is watery. Tingling Effect: It was immediately cool after I lathered it with water and applied on the skin. It’s super refreshing and the tingling effect is especially felt in the underarm, elbow and forearm areas (maybe because I washed these parts first and I have applied more shower gel in these areas). The cooling effect stays on the skin around 10 minutes (or more) after the rinse. Other Effect/s: It’s not really that moisturising (it doesn’t claim to be such) but it is not drying; it is definitely a big plus. It is not itchy on the skin, too. Price: I got this from a swap. Availability: Our local Boots don’t carry this product. I wish it does soon. Will I recommend? : Yes! You should try this refreshing shower gel. It smells so peppermint-y delicious too. Do you love anything mint in your skin, body or face products? What’s your favourite? I did my very first swap with Rae and it was really fun! I like getting surprises but it is twice the fun shopping and putting a package for friends. When I went to South Korea, I told Rae that I was going to get her some goodies that I think she might like. It was kind of just sending a care package for her but on her end, Rae was also collecting some things for me 🙂 We didn’t set anything for this swap, no price limit and date for sending the package nor did we request from each other what kind of goodies we want to receive. Rae also sent me some easter chocolates but they all got squashed. I felt sorry for the chocolates so they are all recuperating in my freezer for a few days now 🙂 I was excited to see an Aero chocolate because I used to always buy it with my cousin when I was studying in Sydney. I love Soap & Glory products especially its body butter, The Righteous Butter. The Hand Food is equally moisturising and smells so much like the body butter – sweet, fresh and citrusy combined. 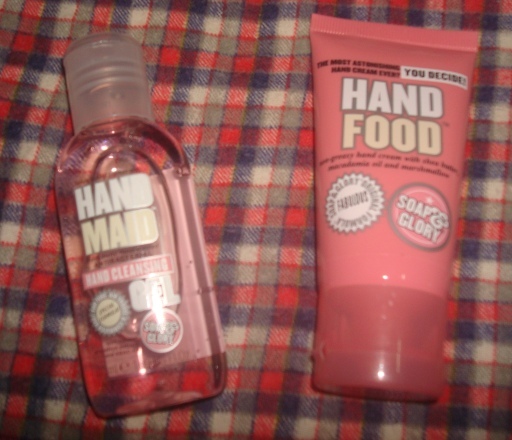 I was happy to get the Hand Maid, too since I haven’t seen any in our local Boots. I haven’t tried a Natural Collection before that’s why I am excited to try this blush in Peach Melba. This line is also available in Boots in the UK but we don’t have this here in Thailand. Rae knows I like to try Sleek makeup products so I am extra pleased she sent me a Pout Polish in Peach Perfection. (I couldn’t get a proper picture for swatches but I’m going to upload it when I can). 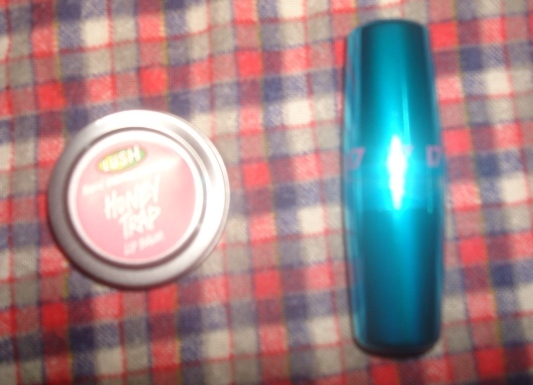 I have also mentioned to her before that I love LUSH products but we don’t have them here in Thailand; that’s why I am so happy to get the LUSH Honey Trap Lip Balm. I super love it! It’s like having a minty white chocolate Toblerone on your lips. It doesn’t have a taste but the smell is divine! Although we have a Boots here, they don’t carry the 17 Mirror Shine lipstick in Belle so I’m excited to try another new lippie. I like it’s shiny blue packaging, too. I was checking my make up case the other day and I realised I don’t have a mascara in dark brown. As if Rae had read my mind, she sent me the 17 Peep Show mascara in brown black. We don’t have this mascara in our local Boots, too. How cool is that? 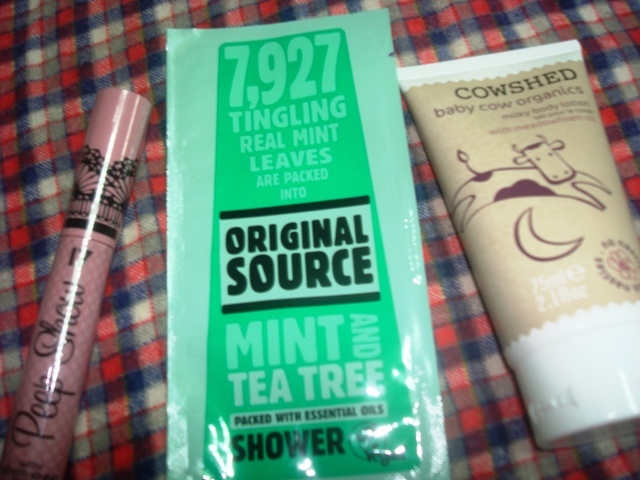 And speaking of cool, she also included a sample Original Source Mint and Tea Tree Shower Gel. I love anything in mint so I tried this immediately. I love it a lot too. It does tingle and render a cooling effect, albeit temporarily, but it is so refreshing! (I went to a Boots here but there’s none from this brand. I got a Boots mint shower gel instead but it cannot be compared to the Original Source one). 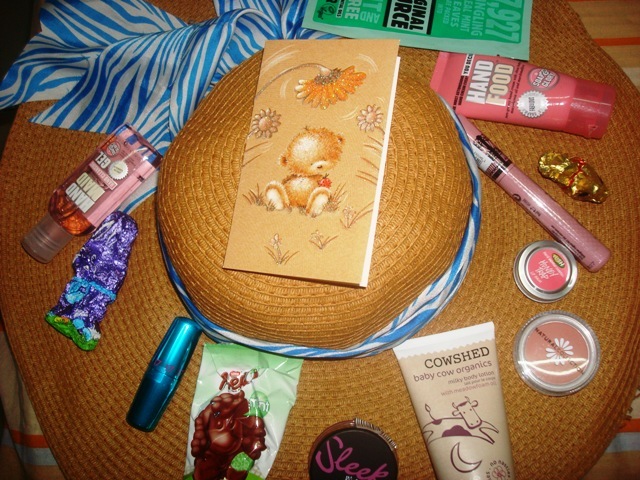 Last but not the least, she also sent me a Cowshed Baby Cow Organics Milk Body Lotion. I haven’t used this for a long time but the best thing about this is that this product is “… paraben, petrochemical and sulphate free, suitable for vegetarians and contain certified organic ingredients”. That’s according to its label which is pretty good, right? Once again, I’d like to thank Rae for these awesome goodies. I love everything! THANK YOU so much! You can check out Rae’s blog at Raelessi. International swaps and meeting new friends are double the fun! Have you tried makeup/ goodies swap before? Care to share? Just this week, I came across some makeup and goodies swap in blogs and youtube and I think it’s fun! I’m not really sure how it works because I haven’t tried it yet but usually these are two bloggers or “virtual friends” who live in different countries and want to swap makeup and whatnot with each other. Usually too, they decide on the price and agree on the date they will send the package. It doesn’t seem complicated, right? I guess it will be easier if the two “swappers” know each other or have followed each other. I think it’s exciting! It’s like having a pen pal but a grown up type 😉 I wanna try it too… one day? Has anyone tried it before? Care to share your experiences?